Professor Marston and the Wonder Women (2017), R, 1h 48min - I hadn't even been aware of this film's existence until a month or so ago when I happened upon the first trailer on YouTube. 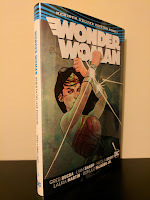 In a year that has seen Wonder Woman dominate the box office and single-handedly breath new optimism into the future of the DCEU (DC Extended Universe), we now get this film about Wonder Woman creator William Moulton Marston's life and its influence on the development of his most well known creation. The Snowman (2017), R, 1h 59min - After I finished reading IT a few weeks back, I set my sights on this novel by Jo Nesbø, with hopes of finishing it before the movie hit theaters. I ended up finishing the source material this past Sunday, which kept me from catching it on opening weekend. But honestly I ended up being even more intrigued by the film after seeing that it was receiving less than stellar reviews along with its sub-par performance at the box office. Thanks to an odd day off from work, I was able to see Tomas Alfredson's big screen adaptation yesterday afternoon, and while I feel as though the casting of characters was pretty good, the film itself is a bit disjointed and anti-climactic. Blade Runner 2049 (2017), R, 2h 44min - Prior to this past week, it had been quite a while since I had sat down and watched the original Blade Runner (1982), which was really a disservice to myself, especially when compiling my Most Anticipated Films of 2017 post earlier this year. On that list, Blade Runner 2049 was only an honorable mention. Had I seen the original more recently, 2049 would likely have easily cracked the Top 10. So prior to seeing Blade Runner 2049 yesterday afternoon, I made sure that I did my due diligence and gave the original a re-watch. And I'm glad that I did. Not only was I reminded of how awesome the original was, it prepared me for what was to come with my theatrical experience for 2049.